Rob Spendlove - Then and Now.....his own website. Some help needed with names chaps - Bill Rainforth is the Staff man but who are the rest.......? First back left is NOT Toby McDaniel, but Steve Robinson - a good mate of mine who now lives in Frome, Somerset. "Could you all have a root around and see if you have a panaramic photo of the 1982/1983 year. Nick Henwood was headboy when I was there. 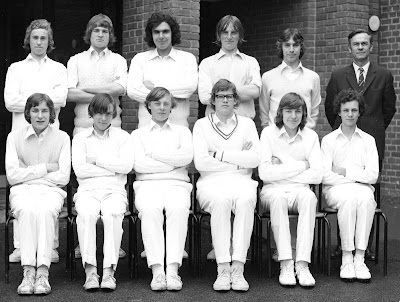 I was at Purley boys from 1981 to 1983 and looking back I had a great time. Other boys in my year were David Bottomley, Gary Sharpe, Mark Blanchard, Toby Galloway and a cast of others." "I have, quite by chance, come across the Fas et Patria web-site - and have been happily wallowing in nostalgia. I wish I had known about the 2007 reunion - especially as it was the last. K. Duffield - Latin. Although I went into the L stream - by parents' choice, not mine, as most of my friends went to G - I managed to fail O-level Latin three times and never did pass it. G.W. Elliott - PE. Caused shock-waves in 1955(I think) when he arrived and initiated the changeover to PE wearing shorts and plimsolls only; we soon got used to being without t-shirts, though, and most of us preferred it. C.M. Flood-Page - Geography. Or, at least, I don't think I was ever taught anything else by him. His size was always a matter of comment (and unkind nicknames) although, after a long illness, he did lose a lot of weight.S. Lockett - English. He had remarkable muscular control of his eyebrows and, if you said something he was not entirely happy with, could raise one of them to a great height. All done with a great sense of humour, though. A.L. Payne - Art. For me, he made this really enjoyable and, by the time exam choices came round, I was old enough to prevail over my parents and take one 'non-academic' subject' which I passed comfortably. I thought it would make a balance against more 'bookish' options and I am glad I did take it as Mr. Payne taught me quite a few things about layout, proportion, lettering, colour and so on which have stood me in good stead ever since. A.A. Rossi - Spanish. During the first year our aptitude for languages (i.e. French) was assessed so that, at the beginning of 2nd Form, we could be divided into three streams - 2L (French and Latin), 2G (French and German) and 2S (Spanish only); this automatically gave the S stream a feeling of inferiority. "I was interested in the article by Chris Richards since it bore many similarities to my own experiences. 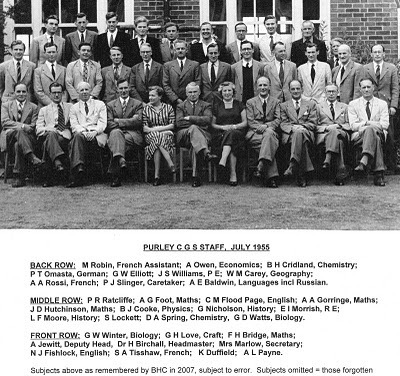 I too am an Old Boy of Purley County Grammar School. I went there in October 1960, my family having just arrived back at our home in Bramley Avenue, Coulsdon after a 3-year stint in Singapore. Dr H (‘Basher’) Birchall was still then the Head, and his uneven footstep along the corridors (he had a wooden leg as a result of war service) can be remembered to this day. He was not a very tolerant man, certainly not of boys who wanted to continue their budding football careers begun at primary school, and we had to tread very carefully when it came to playing with the round ball rather than the oval one. Thus, once a week, we were forced to endure rugby sessions in the freezing cold, mud and rain at the Toller Lane field next to the old primary school, whilst once a day at lunchtimes, we would take ourselves off-site to Bradmore Green, next to Chris’s primary school, to indulge our passion for football. The Green had only one tree in those days, a large tree (still there) which seemed to have an eternal spring welling from its roots, and come rain or shine, we could be found using the tree as a goalpost in the winter and wicket in the summer. When playing cricket, we had to be careful where the ball went. The pond was beyond our reach, but on one occasion, the ball landed in the open back of a passing lorry, and was last seen heading towards ‘The Fox’! Later on, we were given the option of cross-country running rather than rugby, and for a number of years, a group of us enjoyed the delights of Happy Valley and Farthing Downs. We always tried to ensure that the runs were not too strenuous, but we needed to be wary in case a teacher took it upon himself to position himself at the far end of the run to ensure we did not cheat! George Nicholson was the master in charge of running, and despite his apparent age and quite heavy build, he was an excellent athlete and runner. The champion runner mentioned by Chris - Gordon Pirie - was before my time, but I do remember seeing him once running at a great pace up the long, steep hill in Woodcote Grove Road past St Andrew’s Church. Dr Birchall retired in 1966, and the long-serving Arthur Jewitt took over as acting head for two years. He was a quieter, more tolerant man than Birchall, and under his leadership, a Parents Association was formed and an Annual Fete was run. And yes, football was tolerated, not perhaps on the school playing fields, but to the extent that our ‘Staff v Prefects’ match at ‘The Fox’ in 1967-68 was blessed by management. Many of us went regularly to South Norwood to see our beloved Palace in action, and at least two teams of boys and old boys competed in local football leagues for a number of years. All this ended for me in 1968 when I, like Chris, left school and went to work in London. 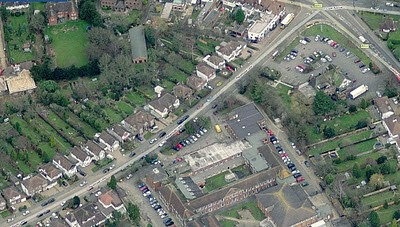 I was an Executive Officer in the Ministry of Health, my first journey was from Coulsdon North to Russell Square, my first month’s pay was £49, and my first quarterly season ticket cost £9, which enabled me to travel from Smitham and Coulsdon North stations, but not of course Coulsdon South which had a superior service! For a couple of years, I too had a motor bike, but after being ‘stitched-up,’ not once but twice by the local constabulary, I gave it up and moved on to a Singer Chamois. Unlike Chris, I did not get involved with Scouts locally until I was an adult, but for many years, I enjoyed my time as a leader at the 20th Purley Group based at St Andrew’s Church, Coulsdon. Sadly, the Group no longer exists, but I enjoyed meeting up with many of my Scouting friends in 2008 when a reunion lunch was held at one of our favourite haunts in Chiddingstone, Kent. And talking of reunions, on an extremely wet day in June 2007, 300 Purley Old Boys crowded into the School for a ‘Final Reunion’ prior to demolition of the old school. For a day, we were back at school (some even with their old school ties on!) and were regaled with tales from personalities such as John Asquith, Bill Patterson and Derek Akers. 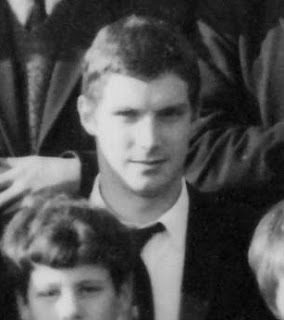 Much of the credit for the Reunion must go to Nick Peaty who has run a fascinating website for Old Boys for a number of years. Put in the school motto - Fas et Patria – on a search engine and enter one of several Purley sites that come up for a trip down memory lane, memories of the now late John Asquith, of George Nicholson and George Love with his guitars, what Arthur Jewitt did during the War, and even memories from my first form teacher – Len Kneller – who has re-appeared after an absence of over 40 years! Although I have been out of the area for twenty years now and out of the Civil Service for ten, I still travel regularly to the area to see my brother and his family. Last summer, I ventured along Tollers Lane, past our rugby field (still there but now surrounded by a high fence), down into Happy Valley past the grazing highland cattle, and on to Chaldon Church – still an oasis of calm despite a gun shoot nearby. The swings and cafe had disappeared from the top of Farthing Downs, and I could have murdered a cup of tea or ice lolly when eventually I arrived at the Marlpit Lane Rec, except that the cafe there was closed (along with the toilets) on a sunny Sunday afternoon. I might have walked rather than run and taken a lot longer to complete the circuit than I would have done in my youth, but I was glad that I took the time to revisit places and bring back memories. "